Rudolf Steiner said the moral value that should be the foundation of political life is freedom. 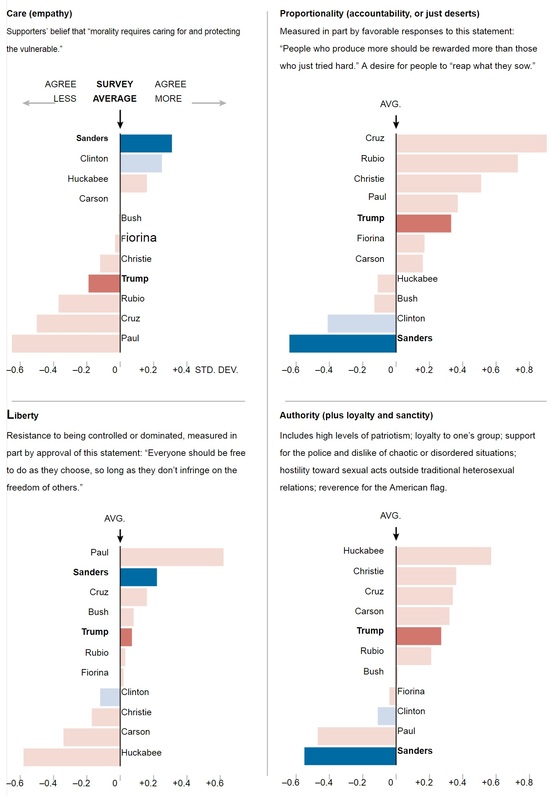 You.gov poll identifys the moral values of supporters of each of this year’s presidential candidates. If Hillary Clinton wins the Presidency I would expect her and the DNC to further rig the primary process to make sure they never again face another Bernie Sanders type anti-establishment challenge. The RNC will likely also try and block anti-establishment candidates. This could make it more important that a populist alliance become a cross-party movement in the event we are forced to go 3rd party. Whatever happens, it is obvious we want to unite as many people as possible. What could possibly be the basis of an alliance between such extreme opposites as Bernie Sanders Progressives and Donald Trump Tea Party supporters? A You.gov poll identified the moral values of both groups. The sides agree only on their support for one value: Liberty. This poll was discussed in a New York Times article and at the Mad Dog Democrat blog. Includes high levels of patriotism; loyalty to one’s group; support for the police and dislike of chaotic or disordered situations; hostility toward sexual acts outside traditional heterosexual relations; reverence for the American flag. Even though both the Bernie Sander's and Donald Trump movements agree on similar issues, the candidates are framing them differently. While Sanders is framing his populist message in Socialism - the caring for others, Trump is framing his message in Nationalism - protecting what is yours. By choosing to frame the same issues in Socialism and Nationalism the candidates remove any chance of joining forces. Both may be destined to hitting ceilings of support and short lived political movements. Sanders and Trump have tapped into the frustration of those stuck on the middle and bottom rungs of the economic ladder. Both reject mechanisms to limit spending on Social Security and Medicare. Both reject the free trade agreements of the past two decades. Both reject mechanisms to limit spending on Social Security and Medicare — and each supports his own version of “health care for all”. Both reject the use of super PACs to raise large political contributions and are convinced that politicians in Washington have sold out to powerful interests that contribute huge sums to campaigns. Both reject military interventionism that consumes lives and resources. “Communication itself comes with a frame. The elements of the Communication Frame include: A message, an audience, a messenger, a medium, images, a context, and especially, higher-level moral and conceptual frames. The choice of language is, of course, vital, but it is vital because language evokes frames — moral and conceptual frames. The civil rights movement made ''freedom now'' its rallying cry. The Rev. Dr. Martin Luther King Jr. used ''freedom'' 19 times in his ''I Have a Dream'' speech. Feminists extended freedom to cover reproductive rights, while Timothy Leary spoke of the ''fifth freedom . . . the freedom to expand your own consciousness. President Ronald Reagan understood the power of the word ''freedom''. His second Inaugural Address mentioned freedom 14 times. But for Reagan freedom meant an absence of constraints on markets, deregulation, tax cuts and a weakening of unions. What Reagan fought for was corporate freedom. President Bill Clinton was also a fighter for corporate freedom, though this is hotly debated. He repealed the Glass-Steagall Act, a cornerstone of Depression-era regulation. He also signed the Commodity Futures Modernization Act, which exempted credit-default swaps from regulation. In 1995 Clinton loosened housing rules by rewriting the Community Reinvestment Act, creating a permissive lending environment that contributed to the financial collapse. Establishment politicians can be framed as valuing corporate freedom while a populist candidate as valuing personal freedom and development. Nearly every attempt to describe Tea Party demographics will mention anger and frustration with government infringement upon liberty and personal freedom. It is a bedrock principle for most Tea Party members. Of course corporate freedom has been framed to mean personal freedom. But the conservative love of personal freedom is an opening to reach them with a unity populist platform if it is framed as enabling more personal freedom. The science has identified freedom to be the moral value that will appeal to all sides. Would it be possible to frame all populist issues within the fundamental American principle of freedom? It makes sense that this framing possibility should be further examined.